Many don’t realize that staying in Ireland after my two years in Wexford were up wasn’t an “automatic” thing. In fact, I decided pretty late in the game that I was going to take a leap of faith and turn down a full scholarship/assistantship offer at an American college in order to attend the Irish Pontifical University of St. Patrick’s College, Maynooth. My first day was a blur. One of my lecturers even commented, “If you’re an international student, I promise you this will be the hardest day of your graduate career.” Boy was he right! Between figuring out the “school” language, finding classrooms with Irish names and no numbers, and not knowing a soul, I was pretty discouraged. However, I found solace in attending daily Mass in St. Mary’s Oratory. Little did I know that my decision to follow the Eucharist that day would lead to a two-year relationship with Ireland’s National Centre for Liturgy (NCL), a body committed to promoting quality liturgy throughout the country. That first day, the Director of Music for the NCL, Sr. Moira Bergin, picked me out of the crowd because she could hear me singing confidently and needed a cantor. Thus began my two-year tenure as the Cantor for the National Centre for Liturgy. I cantored daily Mass several times per week in addition to helping lead the occasional Evening Prayer. I also had the opportunity to participate in several televised Masses for RTE , (think CBS or NBC here in the U.S.,) which was a great honor. Most importantly, ministering with the NCL connected me with people from around the world. I met African Priests and Sisters, Irish laypeople, and Chinese Seminarians, to name a few. Once again proving the universality of the Catholic faith, we were able to work, learn, and minister as one. I hope you’ve enjoyed my Irish tidbits over the last few weeks. I’d be happy to answer any other questions you have about my time in Ireland! 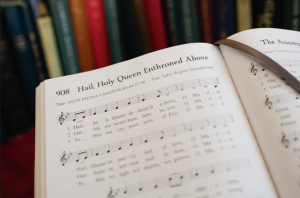 Hymnal Scavenger Hunt How’d you do with last week’s Hymnal Scavenger Hunt? It was Send Us Your Spirit, found in the green hymnal at #433 and the red hymnal at #476. Here’s this week’s clue: This Trinity Sunday, we celebrate the “God in three Persons” that this hymn sings of, complete with a threefold exclamation. Hint: This song may be found in both hymnals!